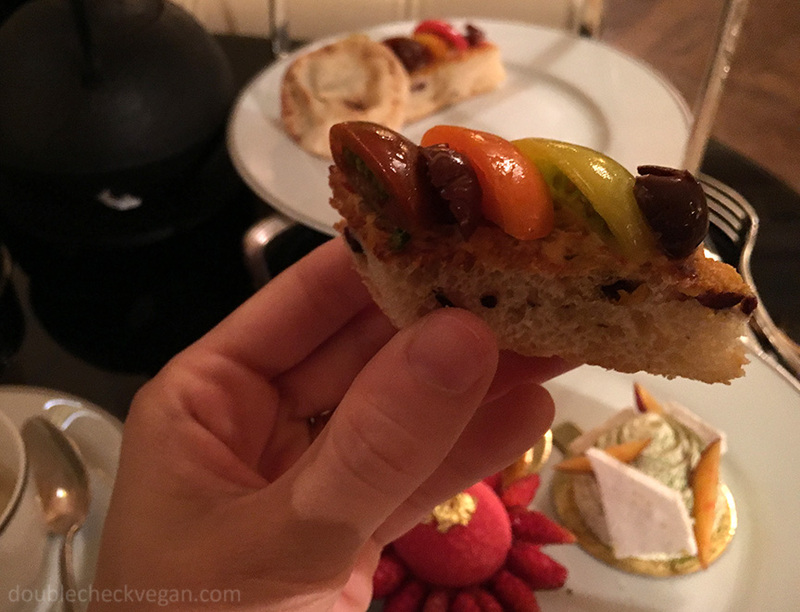 The highlight of my recent trip to Paris to visit my brother was vegan afternoon tea with my mom at the Shangri-La Hotel. My mom, a tea and scone lover, declared that both the tea and (vegan) scones were the best she ever had, and that the vegan whipped cream was on par with dairy whipped cream. I totally agree, but she’s very picky so it’s more impressive coming from her. Scroll down for details and more pictures. I was skeptical the vegan tea would persist two years on in this not very vegan-friendly neighborhood. But my brother, who speaks French, called the hotel and found out it’s still on — everyday from 3pm – 6pm in the lounges on the hotel’s ground floor. 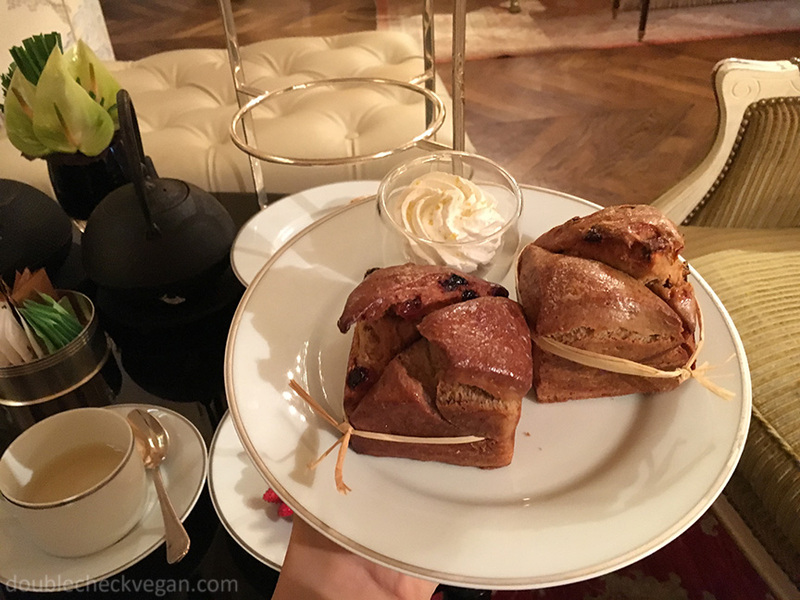 The vegan afternoon tea is €45/one person or €80/two people – about the same as other fancy hotel tea experiences. 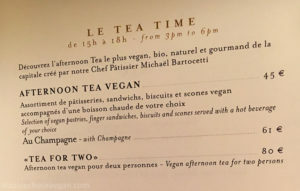 There are individual non-vegan items on the menu, but the only afternoon tea set is vegan. 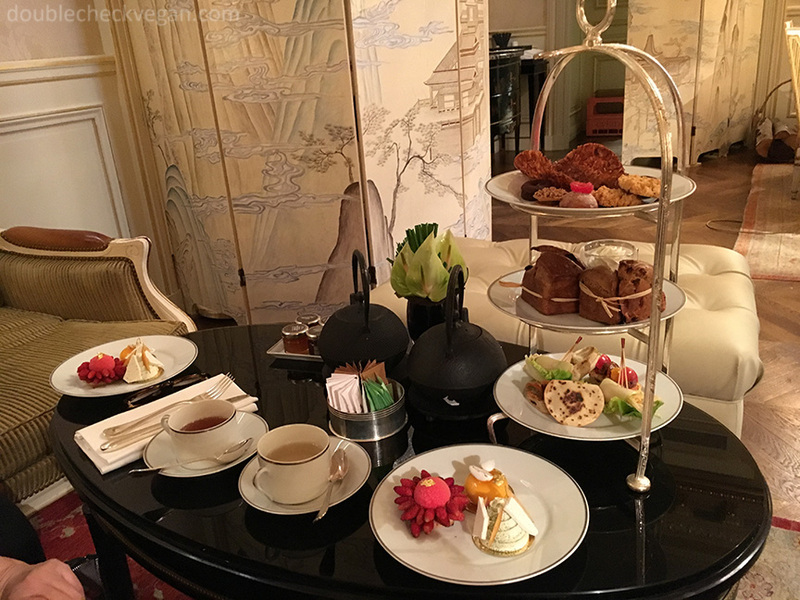 It’s served at comfortable couches and coffee tables in the traditional style of afternoon tea, not to be confused with “high tea” which is served at a high table. I’m still not sure if you need to make a reservation. I recommend making one just in case and mentioning it’s for the vegan tea. When my brother called the Shangri-La, they told him we didn’t need a reservation but he made one just in case, same day, for 5pm for my mom and me for the tea. When we eventually ordered the vegan afternoon tea, they asked if we had reserved it and we said yes and that was that. You get your own pot of tea – you can choose from many different kinds and unfortunately I forgot to photograph the wonderful tea menu – three savory tea sandwich stand-ins, two half scones of different flavors with whipped cream and an assortment of jams, three beautiful dessert pastries, and five cookies – all vegan of course. Here are some photographs of the rest. It was honestly way too much for two people. It was definitely more than the recommended daily amount of sugar, but for a special occasion or once in a lifetime it was a great experience. The savory items included a pita pocket filled with something like guacamole, a spring roll, and focaccia with tomatoes. I enjoyed them, but the scones and sweets were the main attraction. We had trouble finding a server after our tea came and we waited a while for the check. That being said, you might want to sneak in some tupper-ware or baggies since you’ll have plenty of time when no one’s looking to save what you can’t eat. 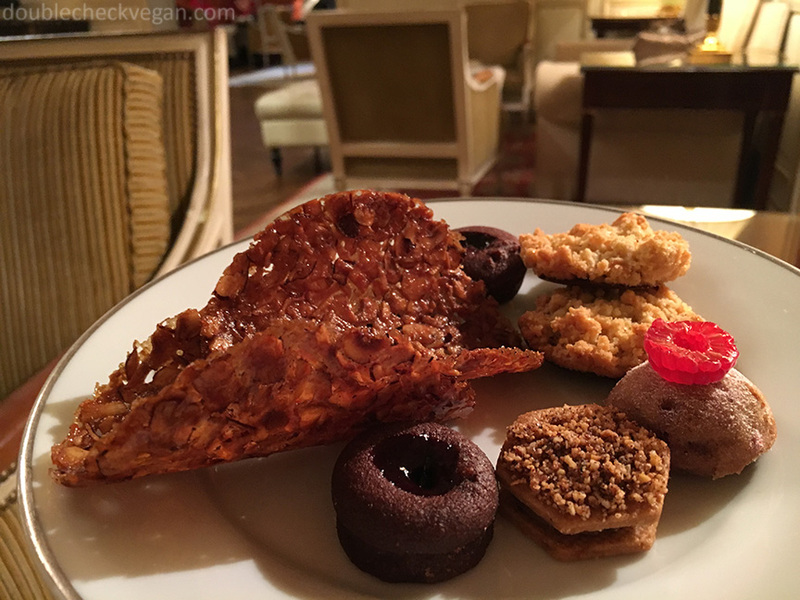 What: Vegan Afternoon Tea – pot of tea, 10 vegan pastries with vegan whipped cream and jams. 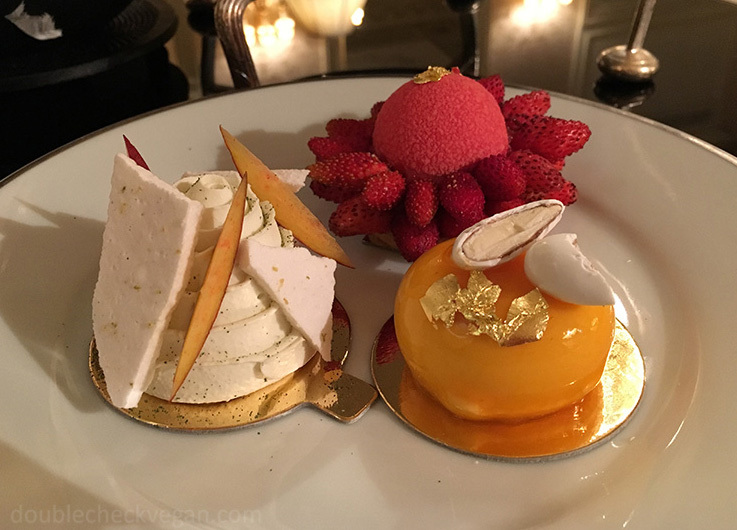 Please contact me if you know of any other vegan afternoon tea or even vegan high tea situations. Also, check out the other vegan food in Paris from this trip.